· This multi-purpose foam sheet from the HMF brand is ideal for the safe transport of models, lenses or other delicate objects. - Fine porosity foam, suitable for a wide variety of uses, e.g. for the safe storage of tools, cameras, miniature sets, collector´s pieces, etc. 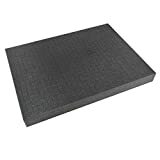 - Pre-cut, perforated foam, 15 x 15mm - ideal for inserting into modelling, photography, tools, measuring instruments, musical instruments, drones and many more - simple and personalized fit Weight: 0.085kg Dimensions (W x H x D): 440 x 45 x 320 mm WARNING: Dimensions may vary by some mm.